"I like the dreamy, surreal stuff, a combination of images that skews reality." "Unlike many things in modern society, there are no second chances collaging with glue. It takes preparation, concentration, and plenty of patience to get everything glued down just right." This Wednesday we're putting on a show! CUT IT OUT! 2 is a group exhibition featuring 9 Sydney based collage artists. The collection of work will explore the different techniques and styles used by each artist. "Have fun with it, be proud to be weird and have lots of spare scalpel blades!" "Glue sticks are for grade school kids. If you want to sell your art, develop strategies for gluing it with a serious adhesive so the work won’t pop off once it’s been sold." "love everything about collage. I love the creative process of telling a visual story. Every image that I pick has a story I want to tell." SCS has three artists in 'Salon de Sydney', a large-scale group show at aMBUSH Gallery. Liz Peniazeva, Nikolaus Dolman and Kubi Vasak were chosen to join over 60 artists that will take part in the show, including well-known artists like Ben Frost, Anthony Lister, James Jirat Patradoon, Liam Ambrose and Holly Greenwood. Opening drinks are this Friday from 6-9pm, 18 November – at aMBUSH Gallery, Level 3, Central Park Mall. The exhibition will continue daily from 12-8pm until Sunday 4 December. More details here. "For me collaging is a form of meditation, it’s a much needed escape from reality." "My biggest influence or better my starting point was the collage ’ Expanding West ’ by the artist Sammy Slabbinck. That was a magical moment"
"keep your scraps, they're often cooler than what you were trying to cut out." "Get experimental and challenge current ideas, be relevant and forward thinking." It's that time of year folks! Time for our Sydney Collage Society birthday bash! This year we are pleased to present our first birthday bonanza chocked full of tasty beverages, groovy tunes and the freshest of collage art from over 10 of our SCS artists! We're super lucky to have the space decked out at Academy Xi in Surry Hills with the help of We Play Records, Young Henry's and Poor Tom's Gin. We're giving you some pretty radical views of over 100 prints of our better than ever SCS artists with a shop to take home your very own limited edition artworks signed by the artists. Take home one or take home 50. This is your night to have an affordable tasty treat of the best collage artists that Sydney has to offer in the heart of the city. We launch DOWNTIME at 7pm (EST) on Sunday April 10th with collage extraordinaire Eugenia Loli. It's a pretty simple concept - getting to know our favourite collage artists around the world with 8 quick questions + a selection of their works. 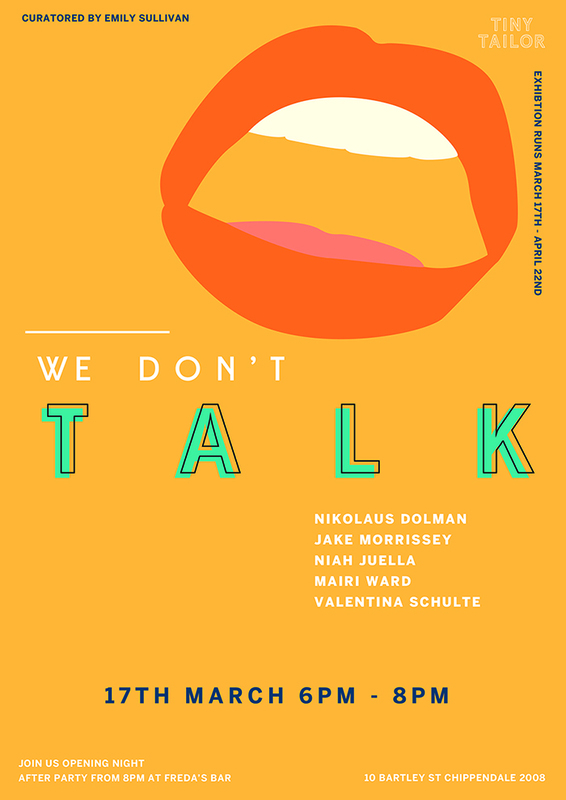 'We Don't Talk' group show featuring Sydney Collage Society artist Nikolaus Doleman opens tonight at Tiny Tailor Gallery in Chippendale, Sydney. EXHIBITION OPENING | Cut It Out! Something You Said launched our best exhibition yet and we can't wait! With the newest works from all of your favourite collage artists, this is one not to be missed! Sydney Collage Society members, Kubi Vasak and Leah Early, were privileged to get an interview with Robert Hogan for his fantastic zine Cut! Check it out and order your own beauty here.